Last night I tried Pearl Dive Oyster Palace, one of Jeff and Barbara Black’s DC-area restaurants. Pearl Dive has been open for almost a year now, and I wanted to check them out before their big anniversary bash. Naturally, I started off with a plate of twelve raw oysters. I got a good variety – two each of six – including Hammersley (Washington), Chefs Creek (British Columbia), Broadwater (Virginia), Battle Creek (Virginia), Wild Goose (Rhode Island), and Fire Lake (New Brunswick). The oysters came out with the usual cocktail sauce and mignonette, but also included was their Dive Juice and Yuzu-Mirin options, which were both great…I especially liked the yuzu with the oysters. 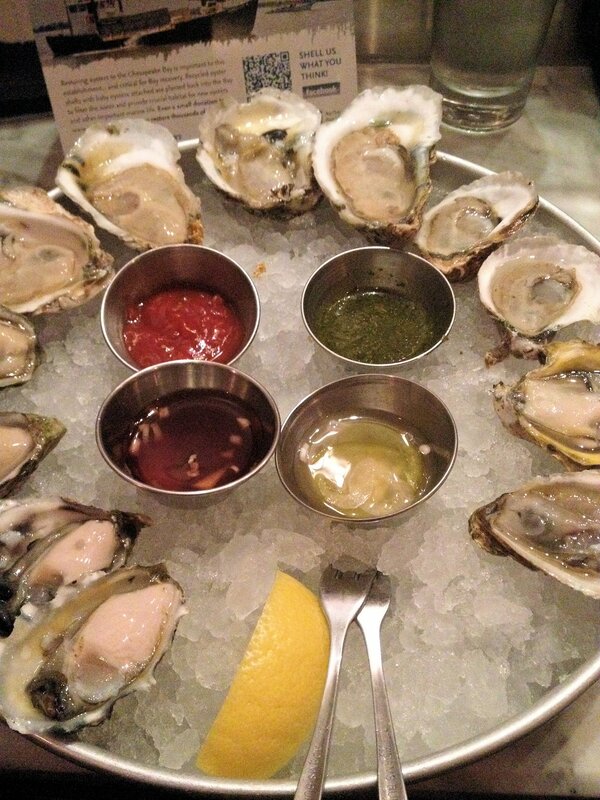 You can’t show up to Pearl Dive and not start out with a few oysters-on-the-half-shell. That would be wrong. Top right sauce was the Dive Juice, bottom right is the yuzu. My second oyster dish of the evening was the Mariscos de Campechana. 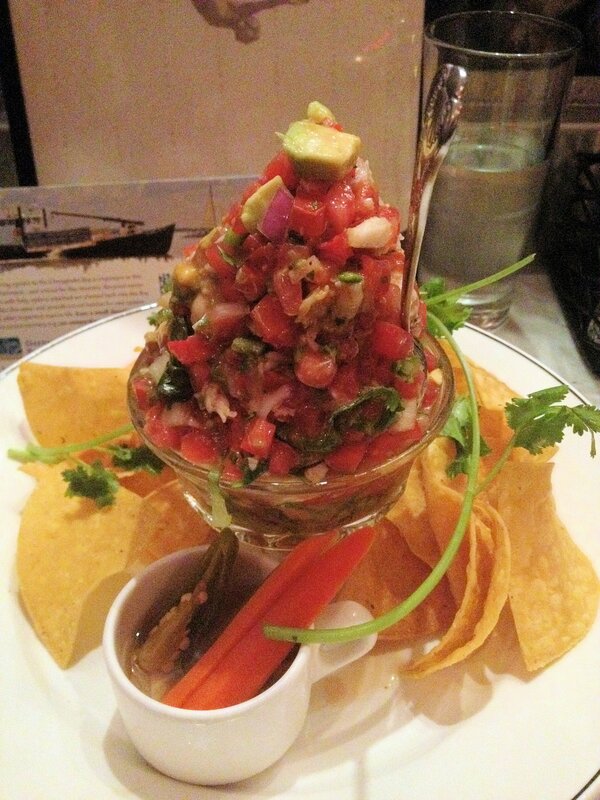 A sundae glass filled with Virginica oysters, blue crab, shrimp, tomato-serrano salsa, and avocado, served with tortilla chips. It was a little bit bigger than I was anticipating, but that was okay as it was delicious. Another great oyster dish…bigger than I was anticipating. Pearl Dive has quite a number of oyster preparations, including some hot ones. My server, Blake, recommended the Tchoupitoulas plate – oyster confit, blue crab, tasso ham, and roasted corn – which was probably my favorite dish of the night. The other options sounded good, but there is only so much I can try in one sitting. 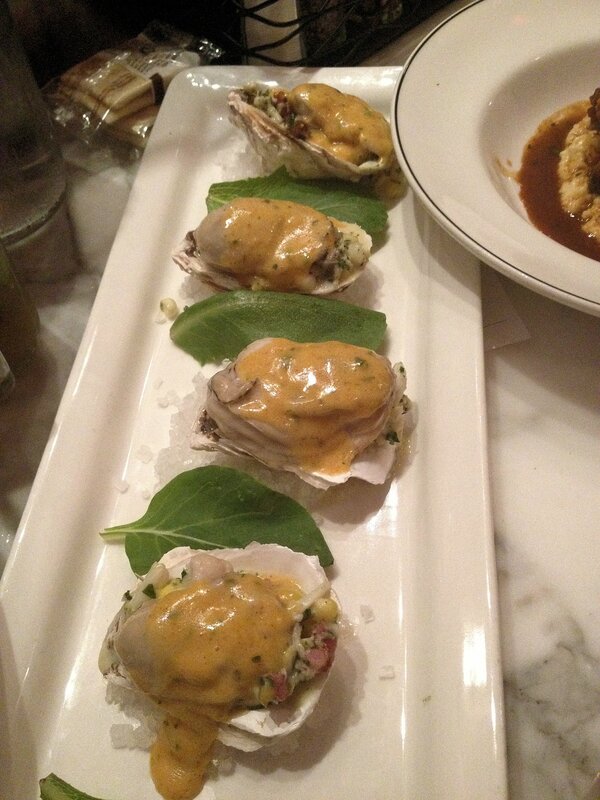 My favorite from the evening…the Tchoupitoulas oyster plate. I closed off the meal with an order of the Braised Pork Cheeks, served with chipotle-ham-hock broth and stone grits. 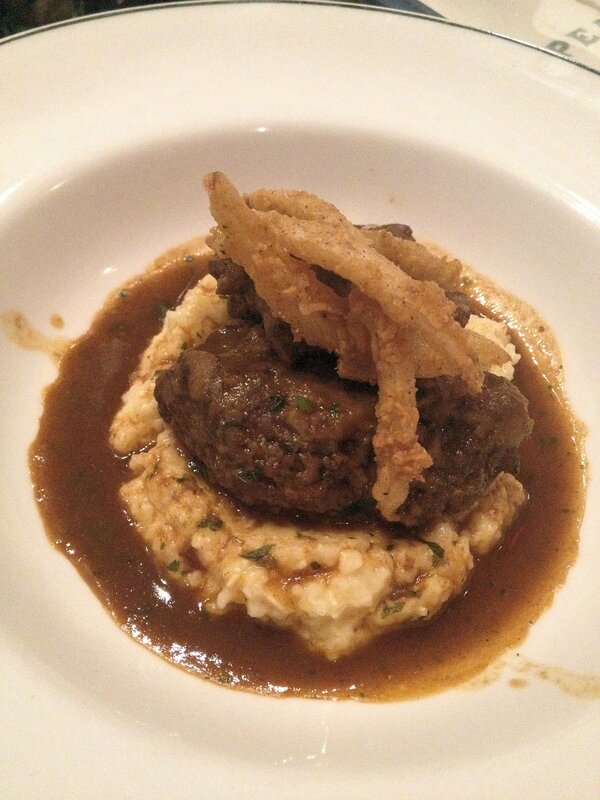 The tender pork cheeks went really well with the grits, which had a slight sweetness possibly imparted by the broth. Nice and tender pork cheeks. Good cocktails as well. 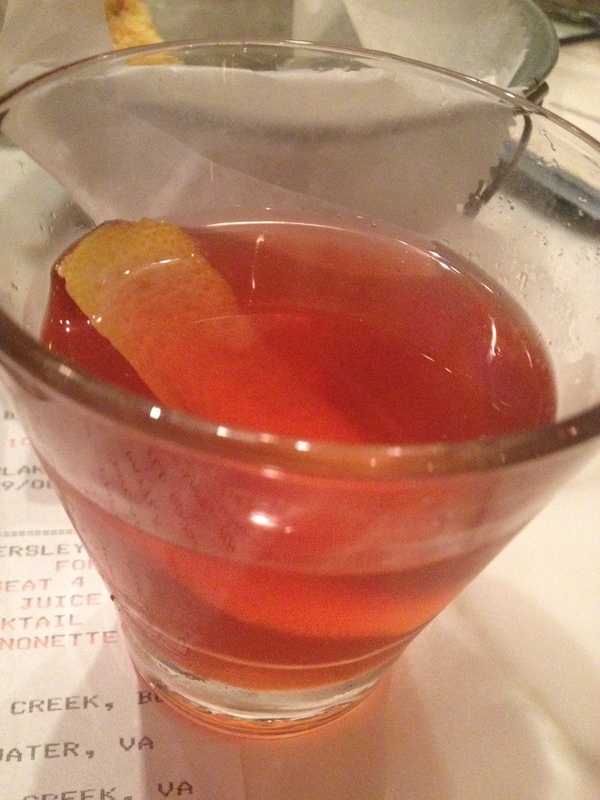 I got a Sazerac to start off…. 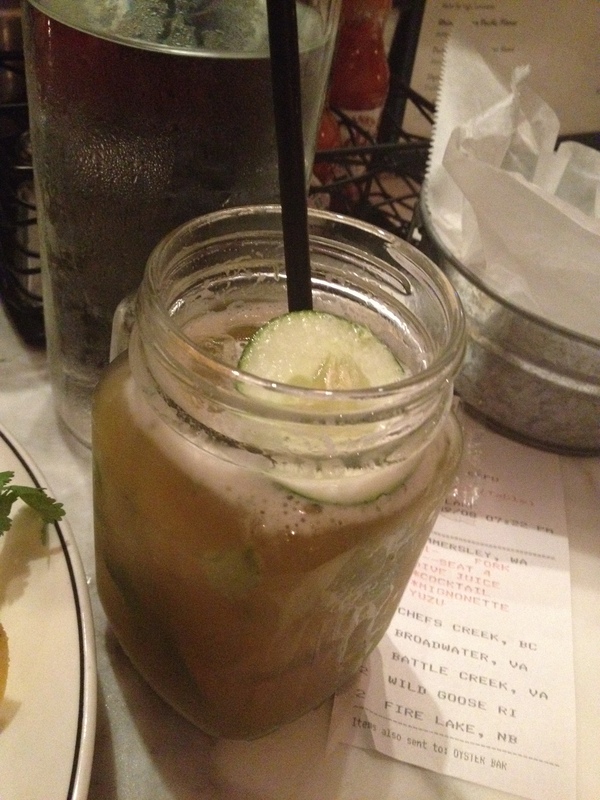 …and finished up with a recommendation – Pearl Dive’s cross between a Pimm’s Cup and a Mule – the Pearl Cup (Pimms, Plymouth Gin, cucumber, lime, mint, house ginger beer). This one was excellent…I’ll be adding this to my list to reproduce at home. Great take on a Pimm’s Cup. Recommend. As a warning, Pearl Dive is first-come, first-served, so try to get there early. I went on a Saturday at about 7 PM and they were mobbed…I got a seat at the oyster bar (four or five seats) which was not. Pearl Dive has a frontage bar which opens onto the street, and would be nice when it’s not as humid as this evening happened to be (here’s some photos of the establishment from the folks that built it). Also, check out Tom Sietsema’s reviewat the Washington Post here…he recommends the catfish po’ boy, which I will be trying next time I stop by. Pearl Dive seats on a first-come, first-serve basis.